Mari Miniatt: I think we need a little more blood. Gore. How much is too much? And why use it? Pretty gruesome way to die, even if you are the monster. But when is too much too much? That's a hard call. Because some readers love the blood and gore, it doesn't have to make sense. The movie 300, very stylish, very visual. But if a person really bled like that, they have a blood pressure that should have killed them long before they were fighting. On the other hand in Hellboy. When Rasputian comes back. He is brought back in a pool of blood. He is covered in it. Yet, it doesn't look like gore. It looks primordial. And it is the only time that blood is used in the movie. How do you measure when you put too much in? Depends on the story, the situation, and what you have established before. If you are writing a vampire story, readers will expect gore. If you are writing a modern love story, probably not. Also the age of the reader, children can handle gross (vomit, farts, etc), but they should not have to read a detail description of a dead cat in the middle of the road. Young adult, can handle a little more. Unless you are writing splatter or gore fiction, you should leave a lot up to imagination of the reader. The shower scene from Psycho. Never once does the knife enter the body, but it is edited so well, and the sound effects make you think it is. The situation; Could the scene you are writing be gory in real life? My husband when he was younger, was the first person on a scene of an accident. The van had slid off the road and into a tree. My husband went up to the van to see if anyone was hurt. The driver's head had been crushed in. He told me that it wasn't until hours later did it register with him what he had seen. His mind would not let him handle the horror of it at the time. If you were to write that scene, a little description here, a hint there. And then later bring the whole horrible aspect into focus. Has your story established that it will not hold back? Building up the gore, is like building the tension. Start with simple things. Maybe start with a nose bleed and work your way up to a beheading. Some writers, and a lot of movies go way over board with the blood. To the point it is physically impossible to happen. Starship Troopers a solider gets ripped apart, if you count the body parts, the man had 6 legs and 3 heads. That example is laughable. But if you go overboard, a serious scene can turn into a parody very quickly. 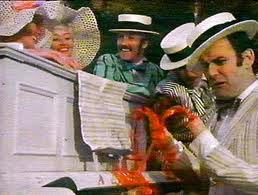 Monty Pythons "Sam Peckinpah's 'Salad Days'" The gore becomes funny, because there is TOO much. Confession time: I don't like gore. In the 80's when gory horror movies were the big thing to watch, I could not do it. I liked horror, but I did not like the gore. It was not the gross part of it, it was the gore for gore sake. I would get bored watching the splatter scenes. So why would I put a scene in one of my stories that involves a man being ripped in half? Because it works in the scene, it is in a genre that expects gore, and it is possible (for a vampire to rip someone in half anyway). I had no problem writing the scene, and no complaints about it either. I have to say that I've been avoiding the Saw films for reasons very similar to this. I agree, it depends on the scene. I loved gore at one point, but I have outgrown it. I now prefer psychological thrillers as opposed to blood and gore all over the place. Also, slasher films tend to be synonymous with sub par acting and story telling. 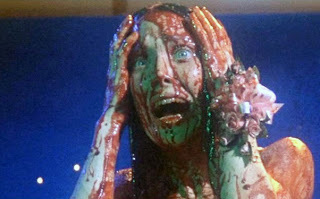 I recently lost respect for one filmmaker who went way too over-the-top with gore in one of his films. It was not believable and had no real baring on the story. It was just done for shock value and I have outgrown that sort of thing. I have not watched any of the Saw movies as well. The first one, I might, the premise sounds interesting. But not the rest. There have been some real dramatic movies, with more gore than slasher films, but the gore works in those stories to move the story along. I am thinking of Schindler's list and Saving Private Ryan. But you are right, just to throw buckets of blood in, where it makes no sense, can become a bore to some of us.